The Last Jedi opened this week, demoting Empire Strikes Back to only the second best Star Wars movie. But since I don't have any Episode VIII toys on-hand to review, I figured this was a good time for something thematically related. The enigmatic former hero of the Jedi Civil War, Darth Revan continued to play a pivotal role in the ongoing war between the Sith Empire and the Galactic Republic. So, first things first: this Revan gets the mask right, where the last one got the mask wrong. Considering that the character's only immutable feature is his mask (the rest - including gender - being left up to the player), it's kind of a big deal if that goes awry. Yes, Revan has a canonical appearance, now, but the mask is still what matters. Since you had the choice to make Revan male or female in the game, the character model needed to be androgynous. [Yet you didn't see idiots complaining about it. Wonder why? --ed.] So the robes cover every single square inch of body (you could also customize Revan's skin color). 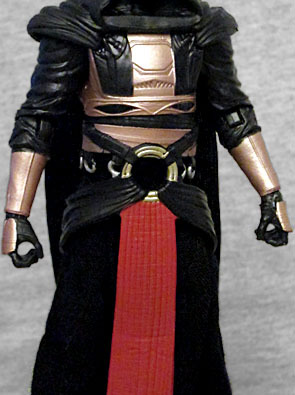 Revan wears armored boots and greaves, plus protective plating over the chest. A black cape hangs off the shoulders, with a hood covering the head. A series of cloth ties hold the belt in place, which is really just a series of large metal rings with a red loincloth hanging off the central one. The colors are better on this toy than the 3¾" verison, with a stronger red, a paler armor, and stronger blacks on the robes. The mask goes with dark metallic grey, giving it just a little bit of contrast against the rest of the outfit while still looking like it belongs as part of the whole ensemble. 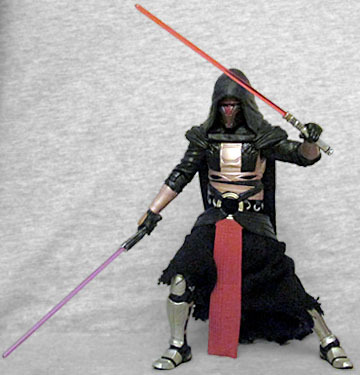 Revan's articulation is the same as other Black Series figures, with swivel/hinge rocker ankles, double-hinged knees, swivel thighs, balljointed hips and torso, swivel/hinge wrists, elbows and shoulders, a hinged neck, and a balljointed head. Don't expect the head to do very much, however, because while the tattered cape is softgoods, the hood and the part of the cape on the shoulders are a single thick PVC piece. The robes around the legs are mostly softgoods, too, so they won't keep the toy from moving. The figure includes two lightsabers: the purple-bladed one he used as a Jedi, and the red one he used as a Sith. Weirdly, it's the "good" lightsaber that looks more threatening and wicked, with metal blades running along the hilt, while the "evil" one is just a simple tube. The blades are separate pieces, removable from the hilts, though there's no hanging the unignited swords on the figure anywhere: he either holds them or he doesn't. I never expected to see this figure in person. It came out in the same series as Leia, Obi-Wan, and Sabine Wren, a group you'll recognize as being "not in stores," so unless you happened to find it in the 90-second window when Amazon had it in stock (or were willing to pay triple retail value) to get it, you were out of luck. But here's the thing: in an effort to bring more traffic into their stores, JC Penney is adding a toy section; if you think that sounds like a pointless plan, consider how often you went to a Walgreens in 2017 compared to how often you went to a Walgreens three years ago. The toy section is small and sparse right now, but the prices are fair. I found this Revan sitting right there on the shelf for $19.99 - that's not even the usual "specialty store" markup! It's definitely worth looking for a local JCP to see if they have anything you want. Who knows what you'll find!